After delays, construction commenced in September on a 59-story residential tower near Times Square designed by Arquitectonica. The second floor will be occupied by the Signature Theatre Company, whose spaces will be designed by Frank Gehry. Times Square has long been associated with Broadway theater and towering hotels, but big-name architecture is a recent arrival, with the likes of Renzo Piano and FXFowle popping up only in the last decade. The Related Companies is bringing all three attractions together under a 59-story roof as construction gets underway on a new hotel and condo project on 10th Avenue. A rendering of the tower, which Related said is outdated. new renderings are expected next year. The $800 million tower is being designed by Times Square veterans Arquitectonica, while Frank Gehry is making his debut in the neighborhood with a performing arts complex for the Signature Theatre Company in the base of the new building. Today, the developer announced a $25 million contribution to the project from the Bloomberg administration, helping secure the Signature’s new $60 million performance space. As in any good drama, the theater company has had its ups and downs as it sought a new home. First, it was to be part of a $700 million cultural pavilion at Ground Zero shared with the Joyce Theater. When that project faltered, the Signature looked across the street at Fiterman Hall, a condemned CUNY building that had been completed just before the 9/11 attacks and needed to be rebuilt, though that too would have cost hundreds of millions of dollars. Eventually, the company came to a tentative agreement with Related last fall for space in the new tower, a deal that was finalized by today’s announcement. “This was just the perfect arrangement for us,” James Houghton, founding director of the Signature Theatre Company, said in an interview after the event. He added that Gehry has remained on the project throughout, and is now putting the finishing touches on models of the design, which will be displayed in a room of their own at the Manhattan Plaza garage, halfway between the company’s new home and its old one on 9th Avenue. Though Houghton repeatedly referred to Gehry’s design for the new theater as “modest,” he insisted that the project cost less than a tenth of what it did at Ground Zero for good reason. To begin with, the Joyce is no longer involved, cutting the programming in half. 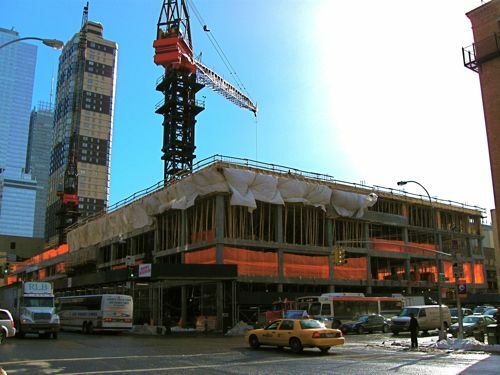 There are further savings because the foundation for the project, so to speak, is already in place, as the Signature will pay only for the fit out of its new space in the Related building, whereas before it was navigating the morass of subway lines and supply roads that ran some five stories beneath the original project at Ground Zero. It also has a larger footprint in the new building, meaning that three theaters—one 300- and two 200-seaters—two rehearsal spaces, and a lobby, cafe, and bookstore can all occupy one floor instead of being balanced across multiple stories. Fundraising has also been robust, with $16 million already committed to the theater from donors, which leaves $19 million remaining after the city’s $25 million grant. Nonetheless, Houghton anticipated construction beginning next year, with completion due by 2012. At today’s press conference, Mayor Michael R. Bloomberg called the project a sign of the city’s ongoing recovery. “The fact that Related Companies is moving forward with the major development project now is great news and will have a profound impact, not only on the cultural industry and the city’s skyline, but also on the local economy,” the mayor said. Related has had its own travails at the site, which went dormant last fall. As did the theater, the developer used the opportunity to negotiate more favorable contracts with suppliers and trade unions, and construction commenced in September. The Arquitectonica- and Ishmael Levya-designed project is seeking a LEED Silver rating, and will include 800 affordable and luxury housing units and hotel rooms. Related spokesperson Joanna Rose said that previously published renderings of the project are out of date, though new ones can be expected some time after Gehry unveils his design. Related is also celebrating today because its rezoning of Hudson Yards was approved yesterday by the city council, following approval of a new affordable housing arrangement by the planning commission. Asked whether that project, which was planned by SOM, would include high-profile designers like Gehry or Arquitectonica, Rose said that decision is still being made. “We haven’t made any determination on who the architects will be for the individual buildings,” she said. 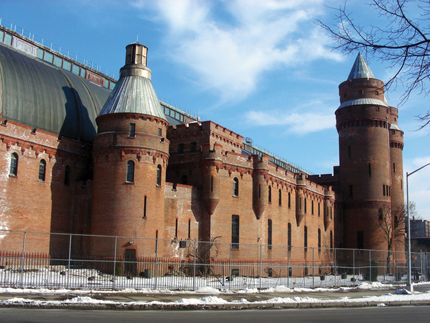 The Related Companies had hoped to build a vertical mall within the shell of the landmarked Kingsbridge Armory in the Bronx. The City Council pushed back against one of the city’s most influential developers and Mayor Michael R. Bloomberg today when members overwhelmingly voted against the Related Companies’ proposal to turn the abandoned Kingsbridge Armory in the western Bronx into a massive mall. The council also extracted considerable concessions from the same developer on its plans for a transformed Hudson Yards. In so doing, the council sent two powerful messages to the Bloomberg administration, which has lost its air of invincibility following last month’s surprisingly close mayoral election. First, members are no longer willing to rubber-stamp the city’s development plans, which they want a greater role in shaping. And second, city-subsidized projects like Kingsbridge—one of several large malls proposed in recent years—will now be expected to provide more robust benefits for those employed by them. Over the last eight years, virtually no land-use project, and none on the scale of the Kingsbridge Armory redevelopment, have been defeated. Some, like the rezonings of 125th Street, Willets Point, and Coney Island, went down to the wire, but all ultimately succeeded through eleventh-hour negotiations. Despite postponing today’s decision twice to buy more time, the project was shot down by a vote of 45 to 1. At the heart of the negotiations was a so-called living wage, a standard well above the legally required minimum that has become popular with labor unions. In the case of Kingsbridge, the community was seeking $10.00 per hour with benefits or $11.50 without. The council argued that because the project was receiving millions of dollars in city subsidies, it should provide a commensurate public benefit. 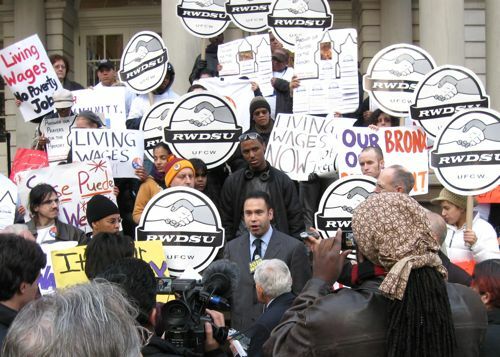 Ruben Diaz, Jr., the Bronx borough president who led the charge against the project with Rivera, called today’s vote the dawning of a new era, particularly for his borough, which has the highest poverty rate in the city. “That notion that any job is better than no job no longer holds,” Diaz said during a celebratory press conference on the steps of City Hall. The project was overturned on technical grounds, because the council is only allowed to consider land-use issues when making land-use votes. Among the issues cited by the council were insufficient parking, traffic congestion, and the asthma threats associated with them. “We cannot approve a project that will bring more people to an area that is already choked with traffic and pollution,” council speaker Christine Quinn said at a press conference before the vote. She did add that there were a number of important non-land-use matters weighing on the decision, though ultimately the technical deficiencies of the city’s plan were enough to derail it. Quinn also heralded her success at Hudson Yards, where the developer has now committed to make 20 percent of the 5,000 housing units affordable, many of them permanently. “Creating affordable housing in any part of the city is not easy, but in my district—where land prices have grown so high in Chelsea and Hell’s Kitchen—it’s even harder,” Quinn said. 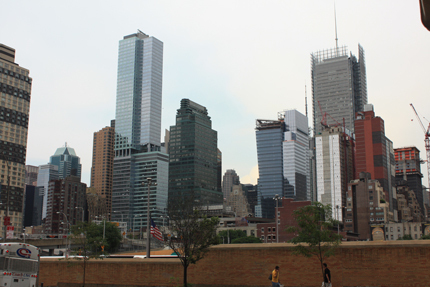 In the rezoning, which passed by a vote of 47–0, the Bloomberg administration agreed to new green space and tree planting in Hell’s Kitchen; moving ahead on a Hell’s Kitchen South historic district; additional community oversight of the 10 acres of open space at Hudson Yards; and a special construction task force that will address quality-of-life issues that may arise as Related builds out its 12 million-square-foot development. Brooklyn representative Diana Reyna agreed, having had her own recent brush with the administration over the Broadway Triangle. Last week, Reyna came within one vote of overturning the city’s plan to rezone the area because there was insufficient affordable housing and community outreach. “Moving forward, we have to set an agenda in this body that will benefit the community, not the special interests,” Reyna said. One of the roles played by the city's 59 community boards—besides issuing liquor licenses—is to oversee local planning issues, and while the input of the board is only advisory, it tends to weigh in the decision making of the City Planning Commission (as was the case at Hudson Yards earlier this week) and the City Council. The only problem is, the boards have no professional planners on staff. Manhattan has been blessed with a great deal of help the past three years, however, thanks to a fellowship program begun by Manhattan Borough President Scott Stringer, and today he announced it will hopefully be expanding to the entire city by next year. Stringer is no stranger to the plight of the community boards, as he joined his when he was still a teenager, and empowering the boards has been a central issue on his agenda. (Like the boards, the borough president's job is as much advocacy and ceremony as it is real executive power, at least since the dissolution of the Board of Estimates in 1989.) Upon taking office in 2006, Stringer launched his Planning Fellowship Program to help place planning students from the surrounding universities—Pratt, Columbia, Hunter, City College, Rutgers, NYU, and the New School—with the 12 community boards in Manhattan. While their work was part time, they helped out with technical challenges, research, and special projects that even the boards' land-use experts struggled with or lacked the time to execute, as highlighted in a story we wrote the following year. This year, two Brooklyn boards—Fort Greene and Park Slope—have picked up fellows, and Stringer, with the backing of the Bloomberg administration, which controls his and the boards' budgets, said today at a press conference that he hopes to have fellows in every board in all five boroughs by the start of the next academic year. Starting this year, the program is no longer run out of the planning department of his office but at Hunter College, which has been the lead partner on it since day one. "With all that my office has accomplished since becoming Borough President, I can honestly say that the Community Planning Fellowship Program is one of our proudest achievements to date," Stringer said in a release. "Not only has the Program focused new attention on what should be the primary role of community boards—neighborhood-based planning—but it has also helped shift the focus of a new generation of professional urban planners toward a real understanding of how community members, local government and land use experts interact and engage in discussions about the future shape of our city." And while we're happy the hear the program is expanding, it can't happen fast enough. After all, just look at the areas being served—Manhattan and two of Brooklyn's toniest neighborhoods—and it becomes clear that those boards still in need of the most help have yet to receive it. 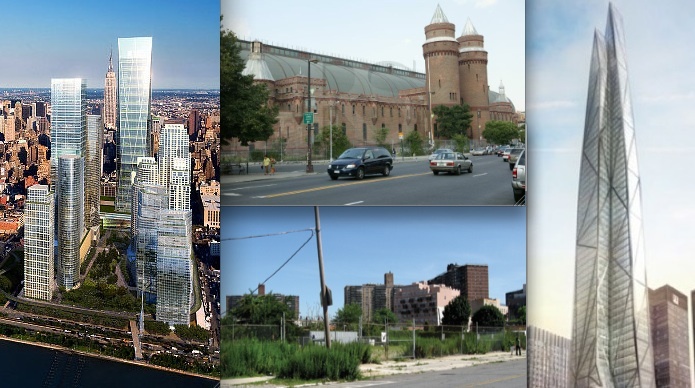 The City Planning Commission decided on four major development proposals yesterday (clockwise from left): the Hudson Yards, Kingsbridge Armory, MoMA Tower, and Broadway Triangle. When the real-estate industry went into deep freeze, word had it that developers would use their recessionary downtime to get planning approvals in line for the uptick to come. And sure enough, New York’s City Planning Commission had a marathon day yesterday, approving the Related Companies’ Hudson Yards project and Kingsbridge Armory redevelopment, the rezoning of the Broadway Triangle in Brooklyn, new approvals for Jean Nouvel’s MoMA tower, and—the biggest surprise of the bunch—the announcement that the city was moving ahead on acquisition of the final stretch of the High Line. Burden added that she expects the process to be completed by the end of the year, at which point it will enter the public review process. The continuation of the elevated park, the first phase of which opened to great fanfare earlier this year, has been an open question throughout the Hudson Yards development process. 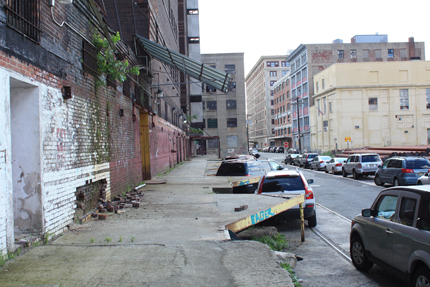 While commensurate open space was required, some developers bidding on the project wanted to replace the High Line with a new park north of 30th Street, arguing its preservation would make building the deck over the rail yards more difficult. Related, which took over the project after Tishman Speyer backed out last year, was ambivalent about including the High Line in its plans. 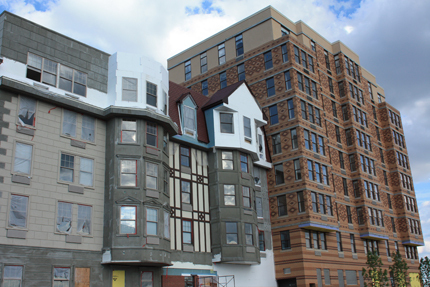 The developer did seem to warm to the idea as the commission increasingly indicated that was the direction it was leaning, working language supportive of preservation into the rezoning in September. Until today’s announcement, though, nothing was assured. Peter Mullan, vice president for planning and design for Friends of the High Line, said after the announcement that he was excited by the news, but more work remains. “This does not guarantee preservation, but it’s the beginning of the process to ensure preservation and the most significant and concrete step in the process,” Mullan said. The city must now come to an agreement with CSX, the national railroad operator, to purchase the final stretch of track. No previous deal had been made because the tracks would have been demolished under the stadium plan, and then the city was unsure what action the developers would take. As for Related’s massive project abutting the High Line, the commission approved changes to the 2005 rezoning, replacing the stadium with one commercial and seven residential towers surrounded by acres of open space, by a vote of 12-1. This will be a part of the completed Hudson Yards, which also includes a parcel east of 11th Avenue that was rezoned in 2005 for commercial and residential use. The commission made some changes to the Related plan for the western yards that was certified in May, following criticism from the local community board and the borough president. In further deference to the High Line, one tower at the project’s southwest corner that would have straddled the elevated park has been pushed back and its height reduced, though it still overhangs the tracks by 50 feet (the Standard rises 30 feet above). Changes were also made to the open space, which had been described as “too Bryant Park” by the board. Now, it will be more tightly integrated with the surrounding buildings, along with more seating and other minor changes. Burden also announced the assent of the School Construction Authority to develop a new primary school within the western development. Related could not be reached for comment about these changes. The major sticking point, and the reason for the one dissenting vote, is affordable housing. “This project will contribute a number of important, positive aspects to the borough,” commissioner Karen Philips said. “But I am concerned by the lack of onsite affordable housing.” Related has pointed out that 600 units will be created off-site, but Compton said that those were promised during the 2005 rezoning. “To take credit for them would be double dipping,” he said. The community hopes to sway the City Council to require the developer to include more affordable housing, ideally within the site, when the council votes on the project in the next 50 days. Things did not go as smoothly for Related’s Kingsbridge Armory, an old military hall in the Kingsbridge section of the Bronx that has lain vacant for 15 years. The developer wants to turn the massive 57,500-square-foot building into a mall, including a 60,000-square-foot grocery store, which has drawn fire from two local grocers that fear it will put them out of business. Four commissioners sympathized with this issue and voted against the project, though it was still approved by 8-4 with one abstention. During the meeting, the room was stormed by about two dozen unionists who have also been fighting Related for wage guarantees, along with the borough president Ruben Diaz, Jr., who was in the audience. The commission did not comment on this issue, but pressure will no doubt be brought to bear on the council. “I vote yes on this item trusting that progress on this project will continue,” commissioner Richard Eaddy said. Another contentious community project was approved yesterday, this one with little uproar. Despite an alternative plan with the support of some 40 community groups, the commissioners approved the city’s rezoning application for the Broadway Triangle 11-1 with one abstention. As for Jean Nouvel’s midtown tower, it had already been approved in September, when the commission unexpectedly chopped 200 feet off the top, leaving it at 1,050 feet. Then, at City Hall two weeks ago, the council decided further changes needed to be made to the street-level facade, which had been more of a concern to the community all along. 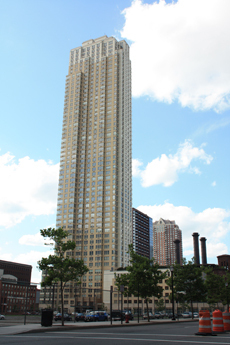 Despite a personal plea from Nouvel to restore the full height of the tower, the council instead referred it back to the commission after reducing the hotel square footage from 150,000 square feet to 100,000, which eliminated the requirement for a loading dock on 54th Street. (The council also requested that MoMA make the wall to its sculpture garden more transparent and community friendly, something that has been a bone of contention since the expanded MoMA reopened in 2004, though that changes was not under the purvey off the commission.) The changes were approved unanimously, and the council is now expected to vote on them in the next few weeks. HOK's 2005 plan for Moynihan Station, designed with James Carpenter Associates. The late senator Daniel Patrick Moynihan’s vision for a new transit hub in Midtown Manhattan took an unexpected lurch toward reality on September 13, when Amtrak president Joe Boardman agreed to move the carrier’s trains from their home at Pennsylvania Station into the Farley Post Office across the street. With that, the stage was set for a new round of design work, and possibly a new dawn for the reincarnation of New York’s legendary rail station. The announcement was a sorely needed boost for the project, which has stalled in recent years in part due to the reluctance of Amtrak, which owns its current home, to move out of Penn Station and become a renter for the first time. But federal stimulus money for intercity rail made the idea seem newly feasible, and a persistent campaign from Senator Charles Schumer won Boardman over to the cause. Still unknown at this point is whether any of the previous station designs, including Skidmore, Owings & Merrill’s original 2001 version, will survive in this latest iteration. The Moynihan Station Development Corporation, which has not yet named an architect, has commissioned HOK to generate planning studies and possible designs. HOK had worked on a 2005 station plan with James Carpenter Design Associates, after the Related Companies and Vornado Realty Trust proposed an $818 million mixed-use development scheme for the project. 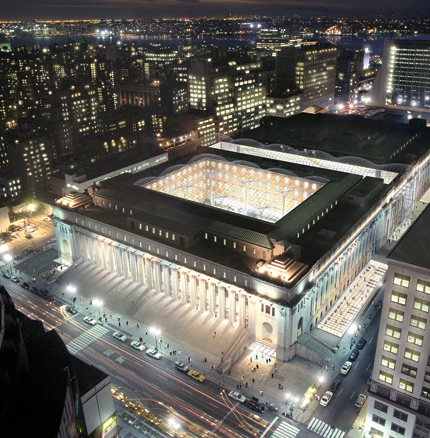 For now, HOK’s plans envision Amtrak’s operations spanning both the original 1912 post office building and its 1934 annex, with the remainder of the program consisting of dining, retail (including potentially a big-box tenant like Target), and about 250,000 square feet for a post office. A grand main entrance would open onto 33rd Street, with two additional entrances on 8th Avenue and 32nd Street. In addition to moving Amtrak’s passengers into the Farley building, proposed renovations to the existing Penn Station would widen corridors and provide a pedestrian connection to a new station underneath 2 Penn Plaza, which will house New Jersey Transit’s planned Mass Transit tunnel across the Hudson. Like many post offices of the era, the Farley was built with a low roof so managers could monitor their employees from catwalks under the trusses, said HOK principal Wayne Striker. To create a sense of grandeur reminiscent of the original Penn Station, HOK is proposing to remove the building’s first floor, and is considering three options for replacing or re-using the current roof. One option would retain the existing trusses but replace their opaque cladding with glass skylights, preserving the current floor-to-ceiling height of 50 feet. A second option would retain only the east-west trusses and top them with a glass ceiling, while a third possibility would remove the current ceiling and install glass skylights suspended from new trusses at a height of about 100 feet. The completed project would advance the Department of City Plannings’s Hudson Yards redevelopment plan, with 32nd Street forming a pedestrian corridor that would extend into a retail arcade in the annex and then descend, via a grand stair, into the main concourse. “I think a very nice retail project could happen here, along the lines of Union Station in Washington, D.C.,” said Vishaan Chakrabarti, president of the Moynihan Station Venture, a joint venture of Related and Vornado. “As Maura Moynihan said to me, when was the last time you heard anyone say, ‘Let’s meet for a drink at Penn Station?’"
Officials at the Empire State Development Corporation, who declined to speak publicly about ongoing discussions, said the agency was waiting until after a decision on federal stimulus funds to select a designer for the project. "We're still weighing our options," one official said. Receiving those funds will be critical to covering the station’s estimated $1 billion cost. “I’d say they’re probably short about half the budget,” said Chakrabarti. “It’s very contingent on making sure the federal stimulus money comes through.” However, with Amtrak now on board, and given the Obama administration’s commitment to funding intercity rail, insiders are optimistic. “I’d say our chances are highly likely,” said Striker. A version of this article appeared in AN 10.07.2009. A worker at her sewing machine in the Garment District, which the city is considering condensing. With Fashion Week in the air, a city proposal that could forever shrink the Special Garment Center District (mid-blocks from 35th to 40th streets, between 7th and 9th avenues) is turning heads. The idea is to consolidate garment manufacturers into one building, which the city hopes will save them while allowing rents to increase everywhere else. At first it sounds appealing: Industries have been sequestered into districts to protect residential areas from pollution ever since zoning was invented. Producers often huddle together for efficiency and employee wellbeing. But the idea of moving all garment manufacturers into one building in the heart of a vibrant and productive urban area would further reduce New York’s manufacturing base, stifle creativity, and ghettoize skilled workers, already besieged by outsourced manufacturing and the recession. 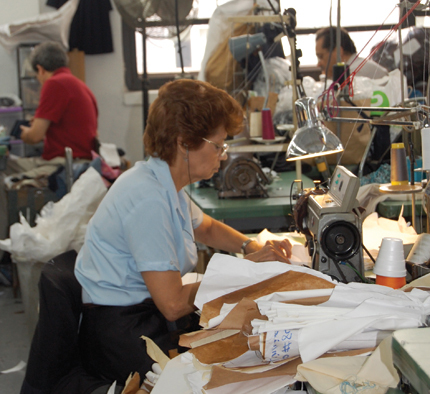 According to the Garment Industry Development Corporation (GIDC), there are currently about five million square feet of space zoned for all related garment businesses in the area, but actual production is concentrated in about 14 buildings, with 60 percent of the space devoted to apparel-related business. Two hundred small factories and businesses of fabric, button, zipper, machine suppliers, showrooms, and the like comprise a substantial 9,000 jobs. Currently, landlords can convert from industrial to commercial use only if they set aside an equivalent amount of production space elsewhere in the district, but numerous illegal commercial operations exist. 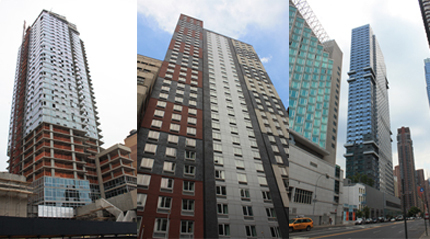 Already as a result of the January 2005 Hudson Yards rezoning, residential use has been permitted on more side blocks where cheap hotels are now under construction. The garment building proposal is similar to one-stop shopping at the D&D Building in Midtown or the failed IDCNY in Long Island City, as well as an unrealized post–September 11 GIDC proposal for a manufacturing building in Chinatown. But there is no mention of whether and how the building now under discussion at 270 West 38th Street would be retrofitted, how it would be decided who located there, and if there will be enough space for future expansion. A version of this article appeared in AN 09.23.2009. 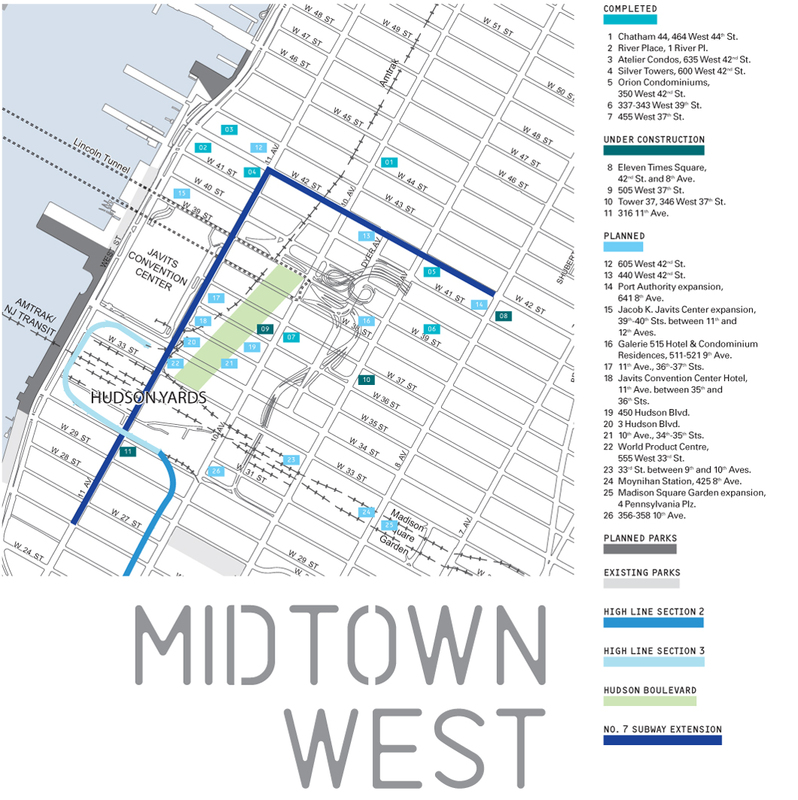 A map of many major development projects in Downtown Brooklyn. Click to view larger. The city may call it Midtown West, but the corner of 8th Avenue and 41st Street certainly doesn’t feel like Midtown. The monochromatic New York Times tower has nothing in common with the lights of 42nd Street, and the new Eleven Times Square, with its relatively rectilinear offices atop layers of scrolling screens, has nothing in common with the Port Authority, which has spawned a brand-name, low-price hotel district just to its south, where McSam and the Lam Group have squeezed shiny buildings onto narrow tenement lots. And that’s only one clash of cultures between the titans in this so-called neighborhood. One can still happen upon charming, low-rise residential streets like West 44th, properly known as Hell’s Kitchen, where the Actors Studio keeps company with home store Domus, and the new construction is the modestly scaled, rather elegant Chatham 44. Another pocket of old-fashioned residential exists south of the Farley Post Office on West 30th Street. These streets are anomalies amid the transportation no-man’s-land imposed by railroad tracks, tunnel ramps, and bus station access. 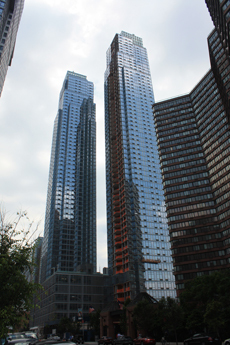 Today they are the last holdouts in an above-ground landscape rapidly undergoing transformation, as the march of luxury residential towers like River Place, Atelier, and now Silver Towers heads across 42nd to the river, buffered by huge commercial assemblages from Extell and Moinian opposite the Javits Center. At least, that was the plan until last fall. Now action has all but halted and will likely remain that way until the No. 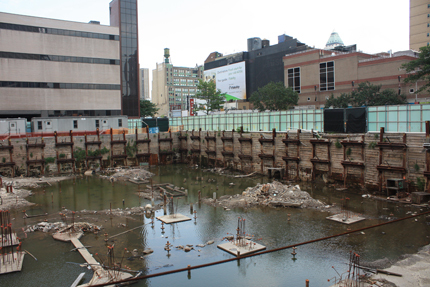 7 train extension to 34th Street is more than its current hole in the ground. The city’s vision for the area, embodied in the 2005 Hudson Yards rezoning text, centers on a brand-new Park Avenue called Hudson Boulevard, which slices the long blocks between 10th and 11th from 33rd to 39th streets. Originally intended as the pompous lead-up to the West Side Stadium, its new role is to create focus and amenity for a future row of green office buildings on its west side, and residential towers to the east and north. 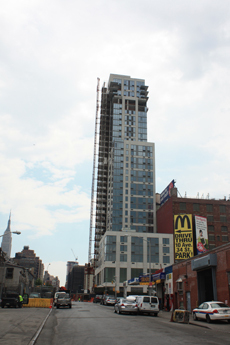 The first three blocks, 33rd to 36th, are scheduled to open in 2013, when No. 7 riders could exit a Toshiko Mori teardrop-shaped station at the base of the park-slash-boulevard to be designed by Michael Van Valkenburgh Associates (MVVA). There are two LEED-certified office buildings in development, Extell’s World Product Centre and Moinian’s 3 Hudson Boulevard, that would open at the same time if both financing and tenants appear. They chose this particular intersection because of proximity to the Baryshnikov Arts Center at 37 ARTS and a large loft building on 37th, since those projects “established a residential bulkhead.” A similar bulkhead may be established when the northern section of the High Line opens in 2010, linking Chelsea to Midtown. Community Board 4 is also working to rezone 11th Avenue north of 42nd Street for residential use, extending Hell’s Kitchen west onto a street of auto dealerships. With zero demand for new office space in Midtown and vacancies at a ten-year high, Moinian director of development Oskar Brecher says his company is in negotiations (and potentially litigation) with the city about starting the small residential portion of their Hudson Boulevard site in advance. Like Brecher, architect-developer Jared Della Valle of Alloy LLC, which owns a mid-block site between 35th and 36th streets, bemoaned the Hudson Yards rezoning for coupling residential and commercial development. “The city has the perspective that this is a 30-year plan, and that it will fill in the way they envisioned it,” said Della Valle. In the meantime, he suggests cultural organizations should come up with interim uses (outdoor movies? Serra sculptures?) for all those fallow lots. Then there’s the biggest site, the Hudson rail yards. Construction on the eastern yard could start anytime (once Related signs a contract with the MTA), with buildings ready in 2015, but now is clearly not that time. The company has a new plan—released this spring as part of the ULURP review for the site—designed by KPF with MVVA as landscape architect, that has received favorable reviews from the community for putting streets back in the superblock and breaking the open space into smaller, more purposeful parks. But what’s a park, even one at the end of the (probably) retained High Line, if it’s shadowed by 50-story towers? Because the floor area ratios for Hudson Yards are being calculated across the entire site, which includes ten acres of open space, the buildings can be much taller than those on a typical city site with a FAR of 10. “It makes sense to have a high-density corridor between 30th and 34th streets, around Penn Station, and then extending west at diminished densities,” said HYCAC’s Levin. The community advisory group’s other major concern is giving a single developer power over such a large chunk of the city. Regional Planning Association president Robert Yaro expressed the same fear and suggested a solution in a recent interview: If the city wants to be involved in the planning, let them set up an authority like the one that has run Battery Park City. That way, the streets and parks would be owned by the city, which would also have the ability to sell development parcels over time, reacting to the city’s changing needs. Related, instead, has to plan today for what New York buildings might be needed in 2015, 2020, or never. 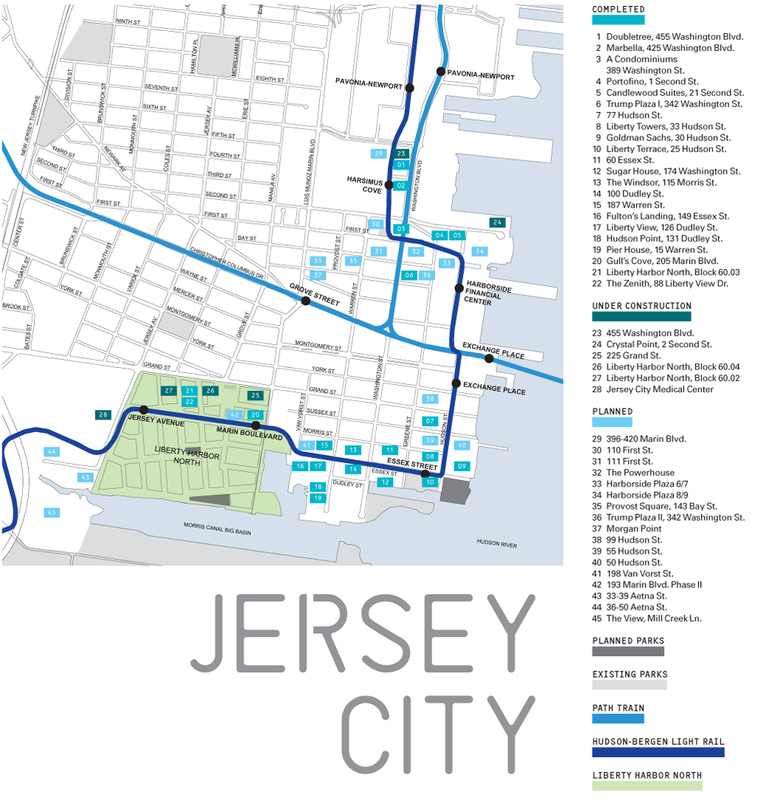 A map of many major development projects in Jersey City. Click to view larger. The real-estate bust has crimped the mayor’s ambitions—the Koolhaas site is dormant as Manhattan-based builders Athena Group and BLDG Management focus on an adjacent rental tower—but it has done little to halt Jersey City’s rising status as a laboratory of urban living. According to a recent city analysis, the current population of about 260,000 is expected to grow by more than 80 percent by 2050, and Jersey City stands to gain 80,330 residential units over the same period. Hudson County has prepared for—and encouraged—this astounding growth by building the Hudson-Bergen Light Rail, which opened in 2000 and runs 20 miles from North Bergen to Bayonne. In the process, the line has turned old rail yards, piers, and industrial sites into a showcase of smart growth whose transit-oriented principles have won broad-based support. The drastic shift in scale seen in some of the new projects—notably three towers proposed by Toll Brothers on and around the site of the old Manischewitz factory—has been prompted by controversial exceptions to the lowrise zoning of the district, which is anchored by the 101-year-old Powerhouse, itself due for a $90 million redevelopment as an arts and entertainment destination by Baltimore-based Cordish Companies. Other towers along the line—like the Cetra/Ruddy-designed 77 Hudson Street, where condos have been selling for $850 per square foot—have also boosted ridership. According to NJ Transit, weekday usage in late 2008 averaged 44,750 passenger trips, up 11.7 percent from the previous year. By far the most intriguing project unlocked by the line, however, is Liberty Harbor North, now a seven-block, lowrise development southwest of downtown’s Corbusian living. Originally designed by New Urbanist firm Duany Plater-Zyberk (DPZ), and revised by Mario Gandelsonas and Diana Agrest, the 80-acre development presents an arresting sight. DPZ invited ten architects to design condominiums and apartment buildings with radically different elevations: Red-brick townhouses, 80s-style classicism, art deco curves, and glass-box modernism all jostle together. 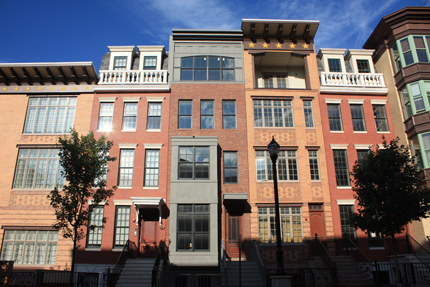 For developer Peter Mocco, the patchwork styles reflect the adjoining Van Vorst Park district’s mix of brownstones and infill construction. “We tried to represent visually all of the different styles,” Mocco said, “not necessarily trying to capture another time in Jersey City’s history, but being sensitive to its history. We are not attempting to create a Williamsburg,” Mocco added, referring to the replicant Colonial town in Virginia. While there is little risk of this former industrial center ever having the staginess of that recreated colony, the new developments present a quirky hybrid of the suburb and the city. “Those look like New York City–style brownstones, but they wrap structured parking,” said Darius Sollohub, who directs the infrastructure planning program at the New Jersey Institute of Technology. “It’s a way to have urban living in a highly automobile-dependent environment.” In that sense, Liberty Harbor may be the most hopeful model yet for this half-finished city—a once highly urban center given new life from planned urbanism. On June 25, Mayor Michael R. Bloomberg announced that the city had acquired a 30-acre spit of land in Queens to build the largest middle-income housing complex since Starrett City in 1974. Situated where Newtown Creek empties into the East River, the Hunter’s Point South project sounded like the best of all possible worlds: a school, 3,000 units of affordable housing for true blue New Yorkers—those cops, firefighters, and schoolteachers that everyone roots for in movies but otherwise ignores—and an 11-acre waterfront park. As usual, however, it was hard not to be cynical. That great mascot of American independent spirit, Ralph Waldo Emerson, once wrote that every soul must learn from making its own mistakes. But that hardly seems like a game plan where the collaborative business of making cities is concerned. New York is currently glutted with grand plans gone awry, dead in the water, or compromised beyond recognition: Atlantic Yards, Hudson Yards, Moynihan Station, ground zero. They do not inspire confidence that this one will fare any better. Apparently, past errors in judgment—May we cut you another deal, Mr. Ratner?—have only served to fuel a determination to repeat until bankrupt. The mayor’s press release made no mention of the hurdles and controversies looming at Hunter’s Point South. Even Wikipedia knows that Newtown Creek is one of the most polluted industrial sites in the country, flowing with an “estimated 30 million gallons of spilled oil and raw sewage.” A clean-up plan was not mentioned. But the real purpose of Hunter’s Point South seems to boil down to the mayor’s need to get a move on his $7.5 billion New Housing Marketplace Plan and its promise of 165,000 affordable housing units. Now, 68 percent of those are supposed to be low income, but none of them, it seems, will be at Hunter’s Point South, where the 3,000 units of middle-income housing will be rounded out with 2,000 market-rate apartments. The mayor did toss in this bone: 3,000 permanently low-income units will be built someplace else in Queens “over the next 10 years,” and an adjacent site will be rezoned to allow for at least 330 low-income units. That’s not much comfort to local residents who have been complaining for years that no one consulted with them about the project, and that the housing qualification of a $55,000 to $158,000 household income is way over their own heads. Once again, city leaders have projected their ambitions on what they see as a blank slate but others know to be an existing and needful community. A version of this article appeared in AN 12_07.08.2009.